I understand and respect those whom like those themes but it just isn't where I think things should go. 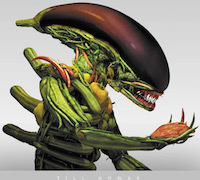 What DON'T you want to see in future Alien franchise projects? Alien franchise can be diverse without this. There are still Ultramorphs, smart aliens, other subspecies. dk I am sick and tired of the alien formula and the whole lot of cliches it brings along. I want something new. A focus on androids and to have crappy written human characters. I am open to different things sure but those are the things that I have had enough of. I don't want Colonial Marines or a popcorn flick. I don't want creatures from other franchises. I don't want to see humans or aliens slaughtered all over, just make them disappear, like in the original film. I don't want to see stupid dialogues or pornographic jokes between annoying characters. Only curses and swears accepted. I don't want to see humans experiments on aliens, no mutants or hybrids, they are generally poorly done. No alien dogs. Keep the original in shape. David's lab was not bad, though. That easter egg is not that bad. I will pick a green egg for Easter. The pics are outstanding. The OP themes for upcoming entries are not imo. I agree. But you know, religion sells well. somewhat OT but this but dude is the king of Sci-fi Common Sense! He has a whole series on colonizing worlds and interacting with aliens. Our titular beasty as least does not get a mention for being a stupid Alien creation. I Raptus That guy is fascinating indeed, but the linked video is about Stupid Alien CIVILIZATIONS. In an other video he considers the Xeno only an aggressive PARASITE and those only by a big stretch can be perfect and definitely are not spare-faring and even civilized. But his criticism could be applied to the Engineers, Weyland-Yutani and David (see the episode on the machine uprising https://www.youtube.com/watch?v=jHd22kMa0_w). I think thats a interesting Question and i will refrain from making comments about other peoples not wants... so as to not come across as disagreeing as everyone has their own opinion on what they would NOT like to see. For me there are a number of things that i will try and keep simple. 1) I dont want them to Abandon/Ignore the Avenues that the Prequels had opened up the Alien Universe was expanded in many ways and potentials by the Prequels (Especially Prometheus) and i felt the route of Alien Covenant kind of placed the LID on that BOX of Potential. So i dont want to see them discard everything the prequels opened up. 2) I dont want to see them have to keep going to the same Formula and Tropes, i know these form the STAPLE of the Franchise (prior to Prequels) and sticking to them is playing it SAFE. I just dont want them to Continue with the same Formula Over and Over... they can use bits of them, but they need something Fresh, because i just feel they could only Squeeze another 2-3 Movies using the Same Formula before they have to to do something NEW. 3) I dont want to see them having to use the Franchise as a Ripley Saga, i think IF done well we could maybe get 1-2 more Ripley Movies but i dont want to see the Franchise having to be about Ellen Ripley, or Amanda (although maybe Amanda could be given 1-2 Movies?) i just think the Franchise is more than just a RIPLEY SAGA. 4) Finally.... i dont want to see them do any Alternative Movies as far as Alternative Sequels or Prequels that Re-Write events of other Movies.. so NO REBOOTS or RETCONS. Aside from those i am pretty open to anything. ignorantGuy what episode does he mention the Xeno!? I have not come across that one yet. I've been thoroughly enjoying his Outward Bounds colonization series at the moment, and have only deviated to Stupid Aliens and a handful of others briefly. I've seen him briefly mention the Yautja/predator species in the above Stupid Aliens series. This recalls the rulebook thread we ran a couple years back. 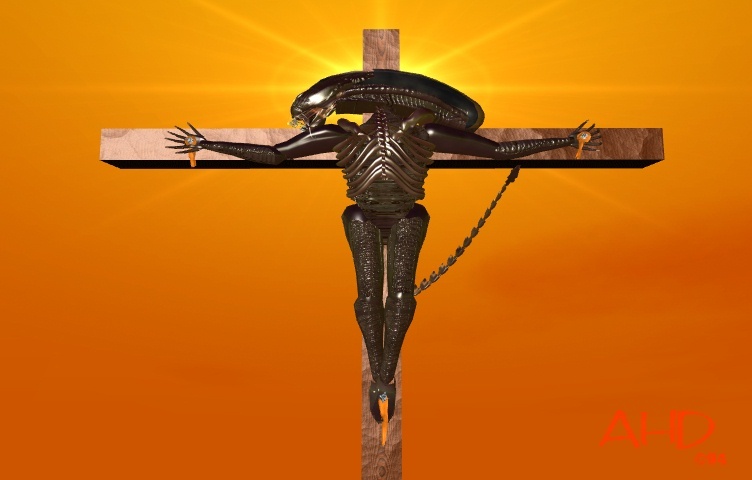 There I stated I don't want to see The Company ever weaponize the xenomorph,but the question here is different.I agree, religious themes should be nuked from orbit.... it's the only way to be sure. ninXeno426 It is fun to be a geezer yes? I forgot about that rule book lol! ninXeno426 As Archie and Edith sang- Those Were the Days! And that was the finalized thread. We did a prep thread prior to this! What I don't want is probably exactly where the Franchise will go, plus it's something a lot of people would be happy about. Jim Cameron is waiting in the wings, as he intends to bring Blomkamp's ALIEN 5 to fruition. Understandable I guess, as it does feature a continuation of his characters! Many people feel that Ridley has had his chance & blown things, so why not have Cameron step in? I don't think it would provide us with anything new, nor push the envelope enough. I'd prefer more Engineer backstory, (why waste a whole technologically advanced civilisation, their motives & history?) plus a full on Gigerverse juxtaposed with believable, interesting, well defined characters whom we care about. As opposed to glossed over, badly written caricatures whose actions & dialogue make us wince. There's so much potential in the Alienverse, so many new places the story could go. We don't need any more re-treads, re-hashes or contrivance. The question remains as to who could bring the correct balance of elements together in an engaging way. For me, PROMETHEUS was a great beginning. I hope that more people reply to this because it is interesting to see what kind of things that people like or dislike about this franchise. I also agree with Lone on this one, no Blomkamp Alien 5 especially if they make it like Alien 3 never happened. No more Ripley, and queens, thank you very much. Some people want Amanda, but I think that we need to move away from the Ripley-ties, she was great in Alien 1-3 but we need to make good characters that are not tied to her, I think that can be done. Spin-offs may be the way to go. So long as, they involve completely new characters. Have the Engineers take their retribution on David, then branch off with an Engineer adventure, then stories involving other Giger-type species, planets, Weyland Yutani, etc, etc. I'm sure you guys can come up with much better ideas than me! I want stories which are forward moving, engaging, interesting. Ridley was perfectly correct when he said that the Alienverse should be expanded. It's just that without his involvement I'm not so sure that will ever happen. Will Disney have the courage to take the risk of going beyond the tried & tested? If nothing else, Covenant proved that troping & playing it safe wasn't really that successful. Ridley scott loves to aproach the "playing God" issue in his movies. I love it too. Religion is an infinite source of wars. I would love to watch the religion of the engineers explained in the Next movie. Who they worship? Why? Is There any connection with US? I love to see religious rituals. The sacrifice is always present. The focus Has to be in the engineers and not in David. I would love to watch an entire movie under the perspective of an engineer. show us their Labs, their scientists, their experiments, shows us a glimpse of their society, show us their army, their weapons, show us...all. Show us something different and unique. It's a mistake to force the exact and precise connection between the prequels and the alien movie from 1979. We know almost everything. The rest is circumstantial.